The final project management meeting will take place on Thursday, 6 Dec at ESA in Noordwijk. Final project results will be presented. A final SMOS-Nino15 project meeting is planned to be held during the Ocean Salinity Conference in Paris, 6-9 Nov 2018. The project team will also present first results from the project experiments in Session 3 of the conference, focusing on the "Impact of Assimilating SSS SMOS Data in an Ocean Forecasting System During El-Niño2015". Presentations from project members presented at the ocean salinity science conference are available from this website. Last results from the SMOS experiment are shown. It is an experiment with the data assimilation of the current network (SLA, SST, in-situ T/S profiles), plus the SSS from SMOS SSS (18-day products sampled at 25km resolution provided every 4 days from SMOS CATDS-CEC-OS LOCEAN). (The L3_DEBIAS_LOCEAN_v2 Sea Surface Salinity maps have been produced by LOCEAN/IPSL (UMR CNRS/UPMC/IRD/MNHN) laboratory and ACRI-st company that participate to the Ocean Salinity Expertise Center (CECOS) of Centre Aval de Traitement des Donnees SMOS (CATDS). This product is distributed by the Ocean Salinity Expertise Center (CECOS) of the CNES-IFREMER Centre Aval de Traitement des Donnees SMOS (CATDS), at IFREMER, Plouzane (France). These results are evaluated in terms of data assimilation verification scores, e.g. the root mean square of the SSS innovations (observation from 1 to 7-day forecast) or more commonly called RMSE of forecast model SSS, see Figure 1, 2 and 3. The Figures 1 and 2 show the comparison between the CONTROL experiment (no satellite SSS assimilation) and the SMOS experiment (assimilated SMOS SSS) over the global domain and over the Niño4 area for the Mercator Ocean system. 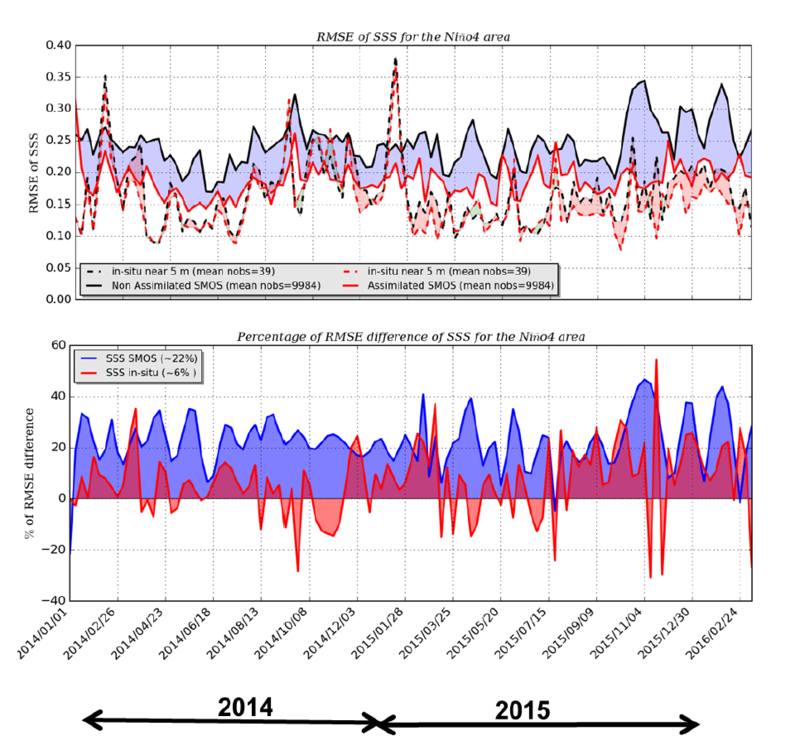 The bottom panels of the figures show that (i) the assimilation of SMOS SSS allows for a significant reduction of the RMSE of 7-day forecast vs SMOS data (on average 25% over the period with some local peaks up to 40% in the Niño4 region) and vs Argo data (5% over the period with some local peaks up to 50% in the Niño4 region), (ii) The impact in the Niño4 area is more important during the second part of the 2015 year (El-Niño phase). Figure 3 shows the comparison between the CONTROL experiment (no satellite SSS assimilation), the SMOS experiment (assimilated SMOS SSS) and the SMOS-Aquarius (assimilated SMOS and Aquarius SSS) over the Tropical Pacific domain for the Met Office FOAM system. The bottom panel of the figure shows that the assimilation of SMOS SSS gives a significant reduction of the RMSE of 1-day forecasts compared to Argo data of up to about 8%. Additional assimilation of Aquarius SSS gives additional improvements to the RMSE for most of the period, but during the first months of 2015 the assimilation of Aquarius SSS becomes detrimental to the forecast. Results from the SMOS experiment, i.e an experiment with the data assimilation of the current network (SLA, SST, in-situ T/S profiles) and the data assimilation of SSS from SMOS SSS (18-day products sampled at 25km resolution provided every 4 days from SMOS 1CATDS-CEC-OS LOCEAN) are shown. These results are evaluated in terms of data assimilation verification scores, e.g. the root mean square of the SSS innovations (observation - 7-day forecast), see Figure 1. Figure 1: rms of SSS innovation (pss) averaged over the global domain for the REFERENCE (top) and SMOS (bottom) experiments from January 2015 to March 2016. The Figure 1 shows the comparison between the REFERENCE experiment (without any SSS assimilation) and the SMOS experiment over the global domain. Only the SMOS SSS after a bias correction (grey line) has been assimilated. the 8-day running mean SMAP V4.0 data are too noisy compared to the 7-day running mean AQUARIUS V4.0 data. The TAO moorings have not been assimilated (data withdrawal) and can be considered as independent data. 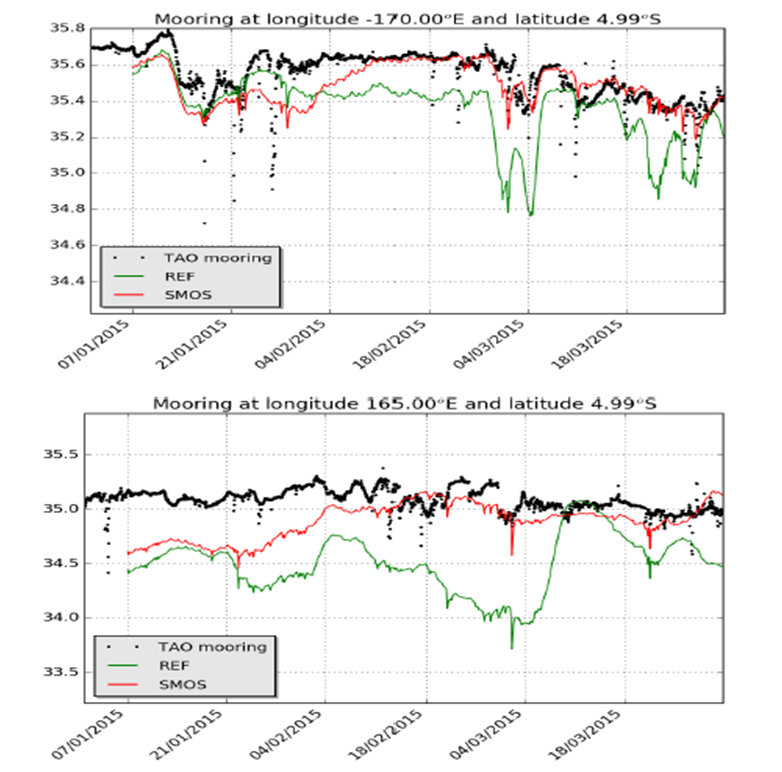 The comparison to two different experiment (REFERENCE and SMOS) (Figure 2) with the TAO SSS (1 m below the sea water) shows that assimilation of satellite SSS data can be efficient. The second project meeting was held on 25th April 2017 and was focused on the SSS data that will be use in this study. The partners discussed the progress on using the SSS SMOS datasets for the study following a previous meeting with two SMOS PIs (Jacqueline Boutin (CNRS/LOCEAN and Nicolas Reul (Ifremer)). 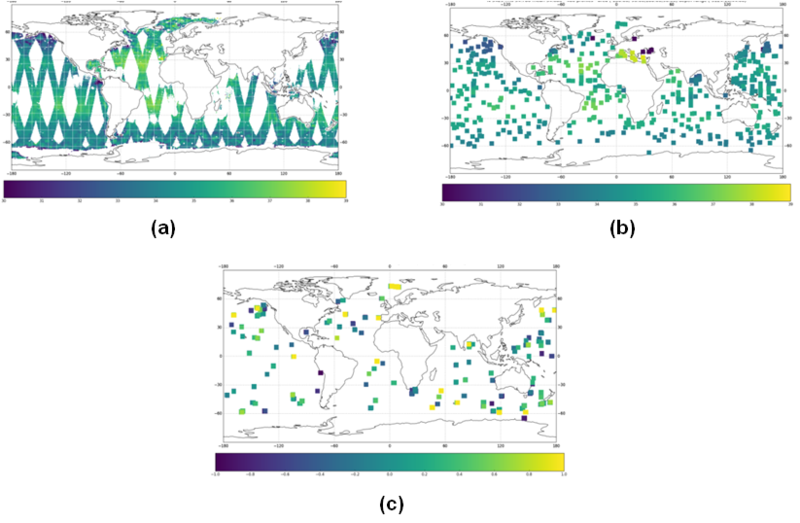 A comparison between the Mercator-Ocean reanalysis (GLORYS2v4) and SMOS data is shown and some metrics were discussed. Recent developments at the Met Office about the satellite SSS data assimilation and bias correction were also discussed. SMOS: New L2 and L3 SMOS products will be available in May 2017 (Boutin et al, 2017) and will be used for our experiments, see Table 1. L4 products ( http://www.salinityremotesensing.ifremer.fr/level-4 ) contain SSS but also useful information (EO data) that could be used for further diagnostics. Aquarius V>&4.0: The last version is available and issues coming out of Aquarius validation analysis (RFI and latitudinal biases) do not greatly affect the Equatorial Pacific. 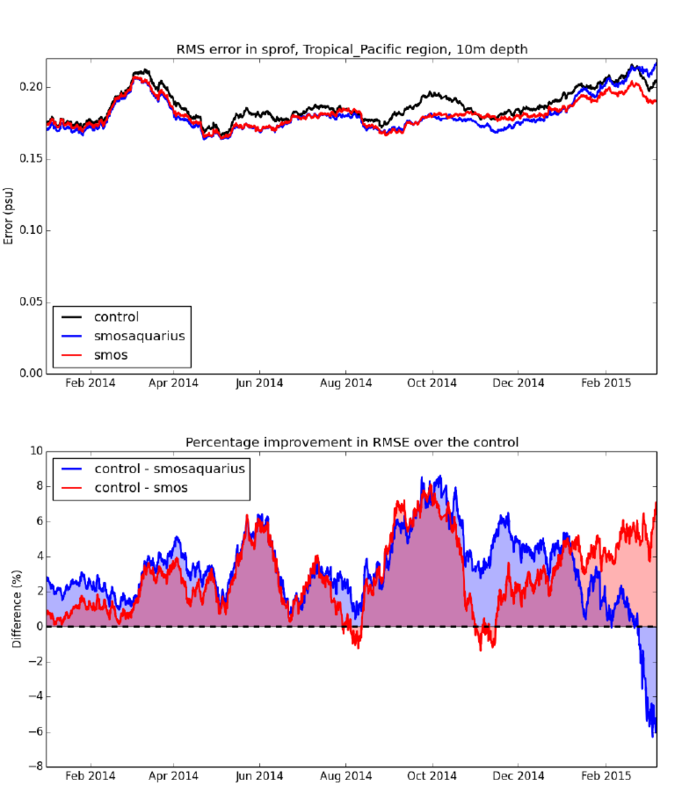 SMAP V2.0: This product has already been used for comparisons with SMOS data and it seems very promising. See Meissner, T. and Wentz, (2016) for the SMAP V2.0 version. Decision: In the study, only data between 40°S and 40°N will be assimilated. Check: All these SSS products exist on a weekly basis with different smoothing levels, but it is still an issue on a daily basis. We have to check if all SSS products are available at a daily frequency which is the data assimilation window of the FOAM system (Met Office). Before assimilating Sea Surface Salinity observations, we assess the ability of the current ocean analysis to reproduce the mean and variability of the Tropical Pacific Ocean as we focus on this region for the OSE experiments. No satellite SSS data are assimilated in those analyses. Figure 1 shows the mean SSS over 2015 of the Mercator Ocean global ¼° reanalysis and the mean SMOS L3 debiased v1.0 SSS data (LOCEAN). Large scale SSS patterns are in agreement but amplitudes and local signals differ. We expect to better reproduce the variability and the small scale signals of the SSS by assimilating SMOS observations, see Figure 2. The largest scales, low frequency signals should be constrained by the sparse ARGO float measurements. 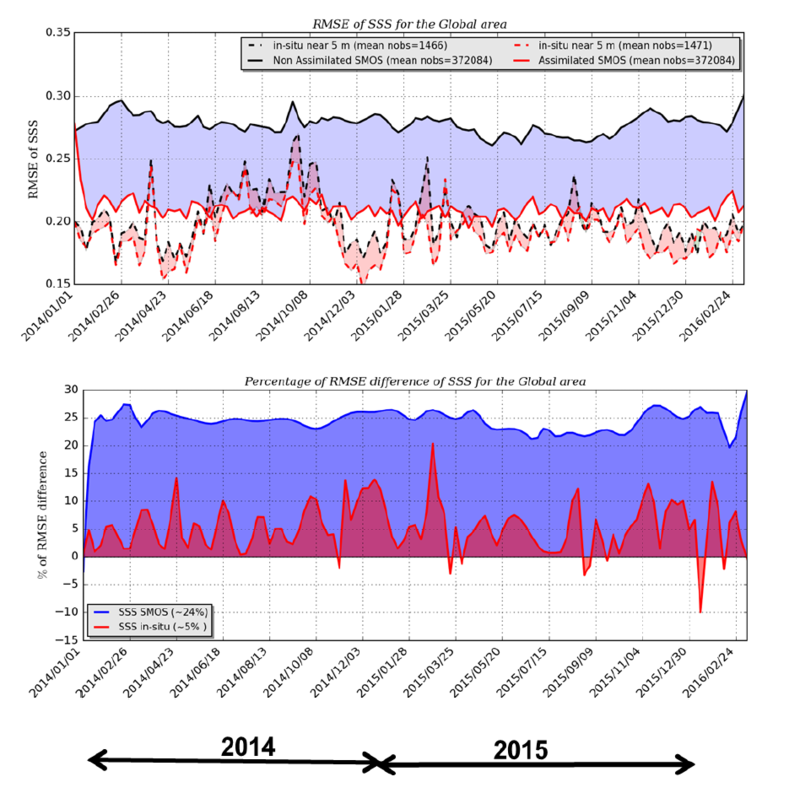 Figure 1: Mean 2015 SSS from: SMOS Observations (left) and ¼° Mercator Ocean reanalysis (right). 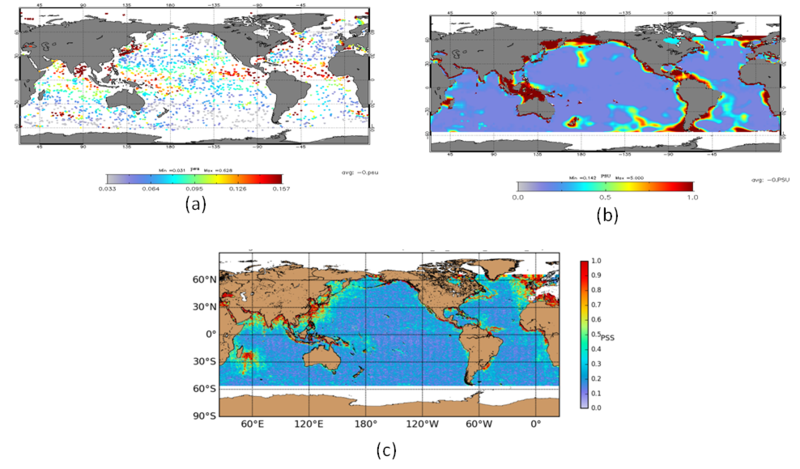 Figure 2: Time evolution of the equatorial surface salinity in 2015: SMOS Observations (left) and ¼° Mercator Ocean reanalysis (right). SSS data have been added into the NEMO observation operator (NEMO version 3.6). It includes averaging model values to observation footprints larger than the model grid. The process of introducing SSS bias correction began with developing matchup code for satellite SSS data and top Argo level salinity data (using top level Argo observations when they are shallower than 5m, within a horizontal radius of 50km, and within one day). See Fig 3 for match-ups for on 1st Jan 2014. All the match-up parameters will be tuned and the observations which are used in the match-up will be removed from the assimilation. The bias correction scheme is able to diagnose an observation error (largest near the coast and where in situ data are missing) which is further use in the data assimilation scheme. The first data assimilation experiment shows that this diagnosed error is still too small and that the specified SSS error (provided in the SMOS L3 Debiased Locean v1) could be an accurate threshold error, see Figure 4. Current networks without satellite SSS. Current networks plus SMAP/Aquarius satellite SSS observations. Current networks plus all SSS satellite observations (using datasets giving the best improvement, if any). Figure 4: Example of SSS observation error used for in situ data (a) and for SMOS SSS data diagnosed by the bias correction scheme (b). The observation error specified by LOCEAN (L3 SMOS debiased v1.0) (c) for the DA cycle on 2012/09/09. Boutin J., J.L Vergely, S. Marchand, S. Tarot, A. Hasson, and G. Reverdin, SSS variability inferred from recent SMOS reprocessing at CATDS, Tue, 25 Apr, EGU2017-3708 , OS4.2, Vienna 2017. The first project meeting after the kick-off was held on 25th January 2017. 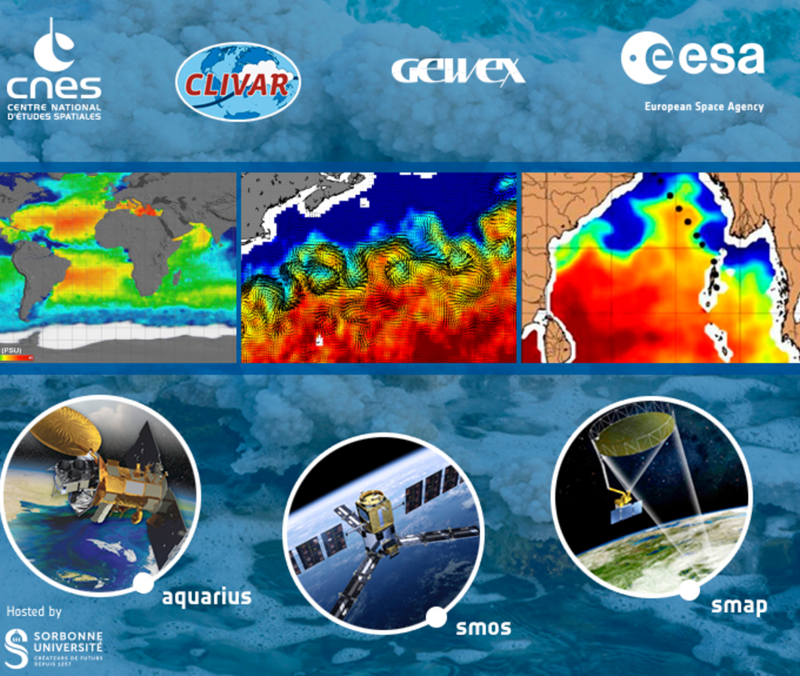 The partners discussed the initial progress on analysing the 2015/16 El Niño using existing data-sets, developments of observation bias correction schemes, and plans for the Observing System Experiments to assess the impact of satellite sea surface salinity (SSS) data on the Mercator-Ocean and Met Office ocean forecasting/assimilation systems. The Mercator-Ocean reanalysis (GLORYS2v4) was used to compare the 2015/16 El Niño with the 1997 El Niño, the two strongest El Niños of recent times. Some of the features of the 2015 event have also been investigated, in particular the three-dimensional patterns of temperature, salinity and currents, and their evolution during the onset of the 2015 El Niño. Fig 1 shows the evolution of the surface temperature, salinity and wind stress anomalies in the lead up to and during the 2015 El Niño in the equatorial Pacific ocean. There is a strong signature in salinity with a fresh pool in the central Pacific due to enhanced precipitation (displacement of the atmospheric patterns). This is in broad agreement with the results of Gasparin and Roemmich (2016) who describe the strong freshwater anomaly during the 2015/16 El Niño based on ocean observational data-sets. Figure 1. 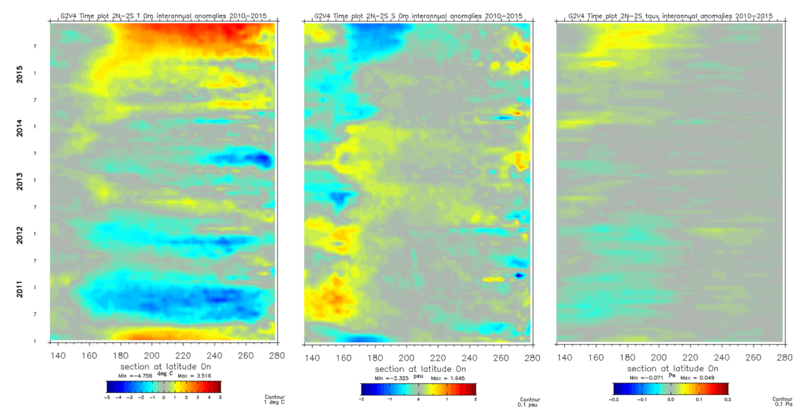 Evolution of the SST (left), SSS (middle) and zonal wind stress (right) inter-annual anomalies in the equatorial band (2°N-2°S) in the Global 1⁄4° Mercator Ocean reanalysis during the period 2010-2015. The bias correction scheme currently used at Mercator-Ocean for in situ data-sets has been modified to estimate monthly biases in SMOS data in preparation for the future assimilation. 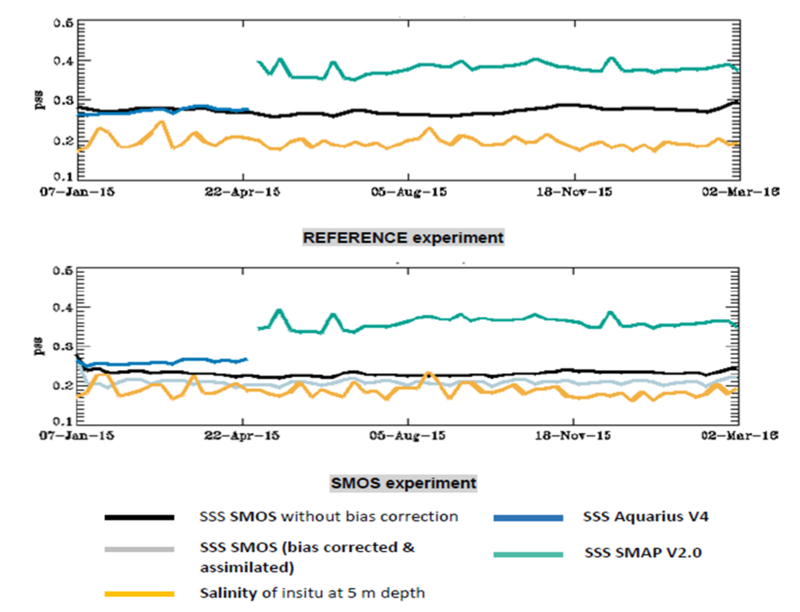 Figure 2 shows an example of the observation-minus-model forecast values (innovations) for bias corrected SMOS data compared with the innovations for in situ near-surface salinity data. The bias corrected SMOS data have similar areas where they differ to the model compared with the in situ data, indicating that the bias correction method is able to remove the significant biases in the data compared to the model. Figure 2. Observation-minus-forecast values over one month in 2012 from SMOS SSS data (top) and in situ near-surface salinity data (bottom). The bias correction scheme planned to be used at the Met Office was also described. They plan to calculate match-ups between satellite SSS data and reference in situ data (near-surface Argo data), carry out a large-scale 2D analysis of the differences, interpolate this “bias” field back to the satellite SSS locations and subtract it to produce bias-corrected observations. These can then be assimilated into the FOAM system. This bias correction is expected to account for real satellite biases, and also deal with issues related to the different representation of SSS in the satellite measurements and model, particularly with regard to vertical processes. It will be informative to compare the bias estimates using this technique and the one used by Mercator-Ocean. A common approach to the Observing System Experiments (OSEs) will be used at the Met Office and Mercator-Ocean, but using different ocean forecasting systems, and assimilating different resolution SSS products. The period for the experiments will be Jan 2014 to Mar 2016. SMOS data are available throughout this period, Aquarius data will be used up to June 2015, and SMAP data from early 2015. A common set of metrics will be used to assess the impact of the satellite SSS data from both systems, and an Observation Impact Report will be prepared to provide recommendations for satellite SSS data requirements from GODAE OceanView. Gasparin, F., and D. Roemmich (2016), The strong freshwater anomaly during the onset of the 2015/2016 El Niño, Geophys. Res. Lett., 43, 6452–6460, doi:10.1002/2016GL069542.